Released 1 December 1986, reached no 3, on chart for 43 weeks, achieved Platinum status. 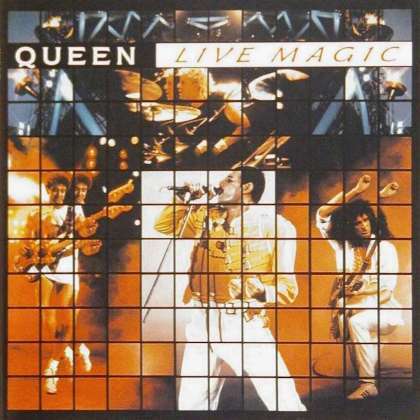 The UK LP and cassette, and Japanese original and 1994 CD's all feature edited versions of three tracks, namely 'A Kind Of Magic', 'Another One Bites The Dust' and 'Hammer To Fall'. Track 1. Track length 5:09, song length 5:08. Recorded at Knebworth Park, Hertfordshire, England, on 9 August 1986. Track 2. Track length 2:59, song length 2:55. Track 3. Track length 1:21, song length 1:15. This track segues into 'A Kind Of Magic'. Track 4. Track length 5:29, song length 5:24. This track contains elements from both the Budapest and Knebworth shows, on 27 July and 9 August 1986, and segues from 'Seven Seas Of Rhye'. The UK LP, UK cassette and Japanese original and 1994 CD's all have an edited version, losing the section from 3:50 to 4:33, reducing the length to 4:41. Track 5. Track length 3:49, song length 3:27. Recorded at the Nepstadion, Budapest, on 27 July 1986. It also appears on the 'Live In Budapest' and 'Hungarian Rhapsody' releases. Track 6. Track length 5:50, song length 4:11. The remaining time of this track is taken up by a Freddie Singalong of length 0:51. The UK LP, UK cassette and Japanese original and 1994 CD's all have an edited version, losing the sections from 1:48 to 2:12, 2:41 to 2:45 and 2:49 to 2:54, reducing the length to 3:36. Track 7. Track length 2:41, song length 2:35. This track begins with the crowd singing a-capella. Track 8. Track length 1:31, song length 1:28. Recorded at Wembley Stadium, London, on the first night, 11 July 1986. This is an edit of the track, which retains only two of the four verses. The full track was later released on the 'Live At Wembley Stadium' 2011 DVD reissue. Track 9. Track length 4:41, song length 4:05. This version has the opera section edited out. Track 10. Track length 5:20, song length 5:14. Recorded at Wembley Stadium, London, on the second night, 12 July 1986. This track also appears on the 'Live At Wembley' album and 'Rare Live' video. The UK LP, UK cassette and Japanese original and 1994 CD's all have an edited version, losing the sections from 0:31 to 1:07, 2:07 to 2:14, and 4:11 to 4:25, reducing the length to 4:18. Track 11. Track length 4:27, song length 4:17. Excerpts of this track also appears on the 'Rare Live' video. Track 12. Track length 1:33, song length 1:32. This track segues into 'Friends Will Be Friends'. Track 13. Track length 1:09, song length 1:07. This track segues from 'We Will Rock You'. Track 14. Track length 2:01, song length 1:56. Some video footage of the track appears on the 'Rare Live' video. Track 15. Track length 1:19, song length 1:06.